I've been looking up novelty Kindle cases ever since I bought my Kindle. As my library has fast extended to the attic and I've become a minimalist, now has never been a good time to hold up a ration card on print books. A pleasant to look at ration card that is. 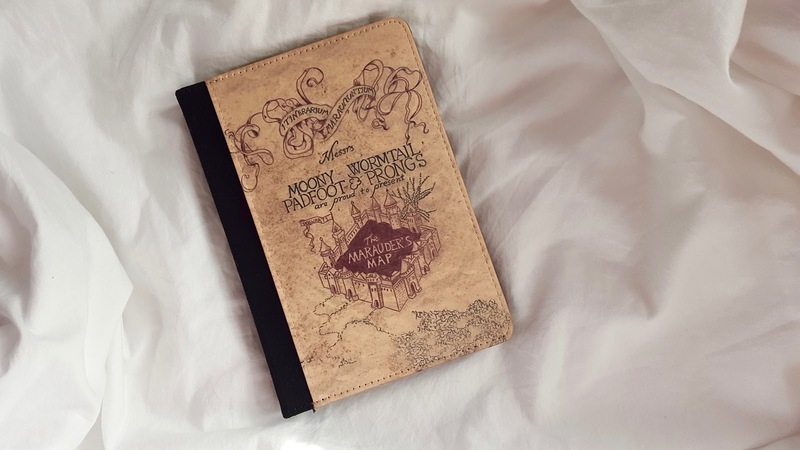 As I am also coming to a close on reading the Harry Potter series (again) I know I'll find it really hard to let the story rest and my enthusiasm can live on when reading other books in this Marauder's Map Kindle. A more than subtle nod to my love for Hogwarts. Of course this acts as small extension to my much loved books and merchandise but it brings me joy. Oh I am easily pleased. In my nostalgic haste I googled 'what to read after harry potter' (yes, that's actually thing check it out) and somehow stumbled across this case. These things just happen. At only £12.60 it's a bargain for such a premium feel case. 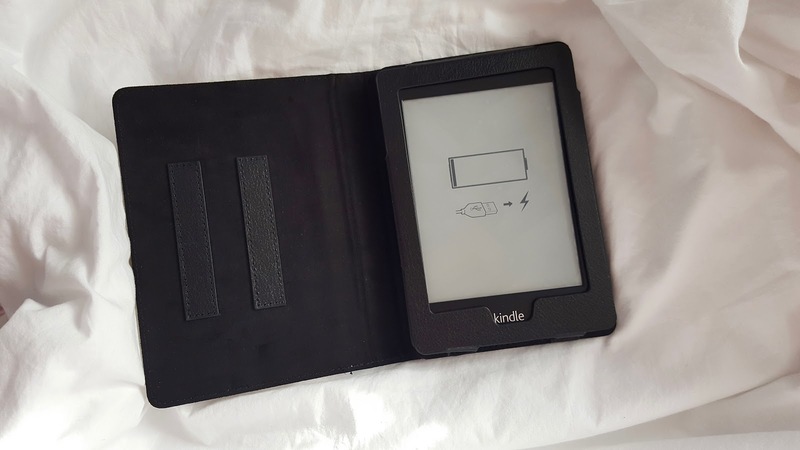 It really protects my Kindle and feels comfortable to the touch. I often forget it's not an actual book. You can get it here. There's a whole lot of other's to choose from such as Advanced Potion Making, Tales of Beedle The Bard, Life and Lies of Albus Dumbledore by Reeta Skeeta and good old Defence Against The Dark Arts. As you can imagine, it was a difficult decision to make and I'll probably get some of the others. 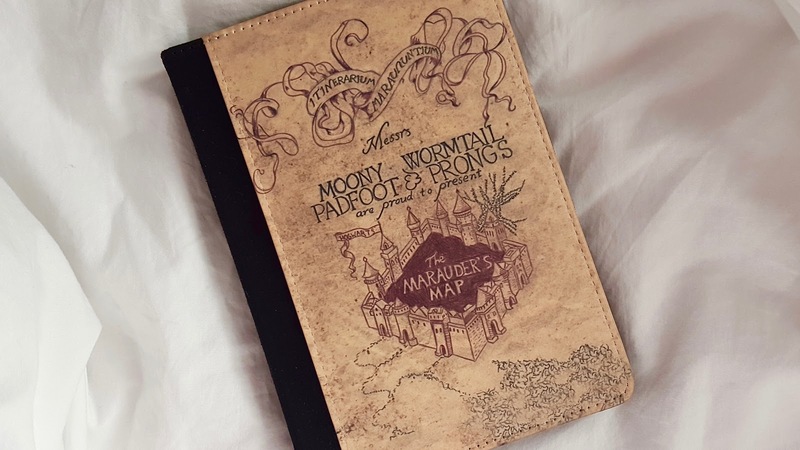 The reason why I chose the Marauder's Map is because it's a magical item I wish I could have. It's presence in the books were really felt. Especially when it was taken from Harry by Barty Crouch disguised as Mad Eye in the Goblet of Fire, and who remembers the moment when Snape attempted to open it with it only snapping back insults? If you love Harry Potter as much as me, I know you'll love these cases. My desk groans with the weight of books never read, an expanding collection of electronic devices and accurately positioned stationary (for decorative purposes only). Let’s not even talk about my inbox. Inbox zero? Extinct. Bottles of hairspray gather dust on the bathroom window sill, and the clothing rail in the loft specifically bought for unwanted clothes is creaking at it's hinges. HOLD UP, buying junk to hold my already ever-growing junk? It is only when I am stuffing a letter in a neatly organised shelf of junk when I realise that my possessions are taking control of me. This is a hoarder’s attempt at tidying: hiding stuff inside other stuff. Convincing yourself you need this crap until you get the urgent desire for a massive overhaul. Then throwing it all out becomes a bit too much. 'Yes, I need these just in case...' I lie, I make excuses, and soon enough I convince myself it's the truth. Enter minimalism. No it's not a cult or some hippie's multi-million pound brain-child. It's a way of life. CLICK TO TWEET THIS Without the abundant clutter of material possessions you’re free to prioritise the stuff that matters: hobbies, work, family. As crazy as that sounds, it's true. Your material possessions may even be affecting your love life! Minimalism or 'living with less', whatever you choose to call it removes mental chaos usually associated with the sight of a messy desk. This year I have challenged myself to live with less. Goodbye to my previous half-hearted attempts at trying not to make impulse purchases or to save more money. 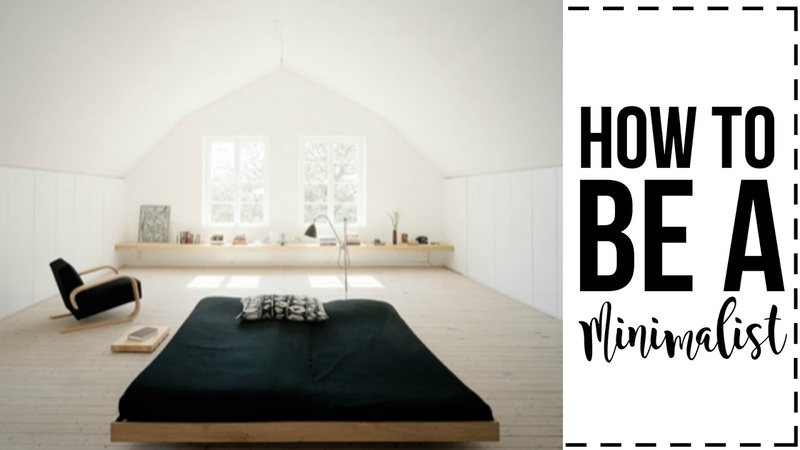 Actively choosing to lead a minimalist lifestyle takes away the hassle of all of that. READ 7 signs you're already a minimalist. Here are my three reasons for waging war on 'stuff'. 1 My time would be better spent on people I love than objects I don’t – half a weekend is a ridiculous amount of time to spend tidying my room. 2 The reason why I so enjoy a hotel stay is because I have what I need and I need what I have. 3 I forget about that really good book I wanted to read because it's been camouflaged by a mass of 'stuff' the past few months. What's yours? To enjoy clean-space-clean-mind for studying? Stop having to walk past a slush pile of old letters every morning? Whatever it is, make it your mission to eliminate the visual noise now. We live in an age of INSTANT. Instant messaging, instant replies, instant access, instant instant instant. Start by removing email notifications from your phone and give yourself an hour's dedicated time a day to look through emails - only if necessary. Any overused apps? Move WhatsApp, Twitter, Instagram and Facebook on the fifth page of your phone in a folder named “Must you?”. Ask yourself 'do I really need this?'. If the answer is something along the lines of 'maybe' or 'but it was expensive' or 'just in case...' EXTERMINATE. NOW! Check out this amazing site Freecycle where people donate their unwanted stuff, you can do swaps or just get something for free! I'll be running a dedicated series on minimalism very soon. Everything from sorting your jewellery collection and DIY draw dividers. Stay in the know by following on Bloglovin', or Twitter. Tweet me with #BEMinimalist to tell me how you're being minimalist.